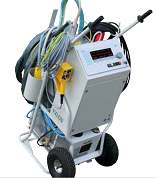 Mobile X-ray generators from YXLON International are designed to supply very high power in areas with limited space or access. For instance, these generators are perfectly designed for operations at nuclear power plants and in the petrochemical industry. All components are carried on a trolley equipped with positions for tilting and a hook for lifting via crane. The mobile system’s high-voltage cable is additionally shielded in order to secure safe operation for your company and a long product lifetime.